Three more new generic Top Level Domains have been recently released to the Internet. 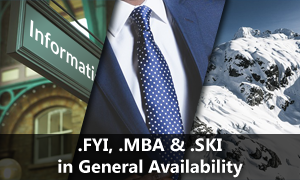 Anyone across the globe can now register a domain name under .SKI, .FYI and .MBA. The global domain authority ICANN launched the New gTLD Program in 2014 aimed at increasing competition and choice in the domain market. When a domain enters General Availability phase, any business, organisation, group or individual can register a domain name within that namespace creating a unique and meaningful Internet address. With the introduction of new gTLDs, establishing a recognisable online presence has become easier as the they are considered as more relevant than country code or legacy TLDs. If any of the new domains are of interest to you, please feel free to use our search tool to check if your chosen domain name is available. Feel free to check out an extensive list of other domains – local, generic, national or exotic – that we have on offer. If you have any questions, please do not hesitate to contact us by email at support@web-solutions.eu or via phone on +44 (0) 208 133 3994.